Pick available space to rent. Artwork must be approved before it will be sent to print. We will keep you updated on timing of your ad printing and when it is placed on the bus. We pay for the printing of your ad. We will send you a photo of your ad on the bus as soon as it is possible to get you one. The contract starts two weeks from the signing of the contract unless we fail to get your ad on the bus by that date or if we have agreed on a time to start. Offer Expires on 07/1/2019 or Before if Spaces are Sold Out. Can I get a discount on a Suntran ad? Can I just pay one payment for my Suntran ad when I start? Yes you can pay in full at the signing of your contract. Can I pay monthly Payments for my Suntran advertising space? Yes we collect the 1st & the last month to start. Do I have to pay any kind of deposit for my Suntran advertising space? Yes we collect first & last. Last month is held as a deposit. Do I have to pay for any printing for my Suntran ad? No, we pay for the printing of your ad. 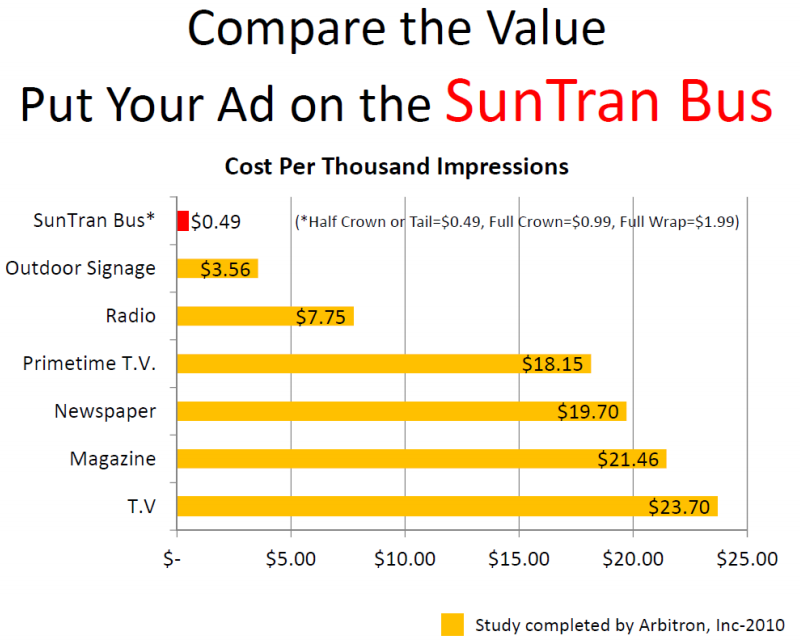 Do you give discounts on Suntran ads to non-profit? No, we can’t show favoritism to anyone. How long will it take to get my Suntran ad done and put on the bus? We do our best to get your ad done & on the bus in two weeks. How many Impressions will I get with my Suntran ad? You get over one Million impressions per month. How many Suntran ads do I get? Is my Suntran ad always on the same route? No, the buses rotate routes.